What are the Correct Strains for Patients with Chronic Pain? Medical professionals have a legal right to recommend cannabis as a treatment in any state, as protected by the First Amendment. That was established by a 2004 United States Supreme Court decision to uphold earlier federal court rulings that doctors and their patients have a fundamental Constitutional right to freely discuss treatment options. State rules for qualifying an individual patient for legal protections when using medical cannabis differ as to who may make the recommendation and for what conditions, as well as how that recommendation is communicated to the appropriate state authorities. Medical professionals and individual patients should familiarize themselves with the applicable laws and regulations in their state. What doctors may and may not do. In Conant v. Walters, the Ninth Circuit Court of Appeals held that the federal government could neither punish nor threaten a doctor merely for recommending the use of cannabis to a patient. [4, 5] But it remains illegal for a doctor to “aid and abet” a patient in obtaining cannabis. This means physicians and other medical professionals may discuss the pros and cons of medical cannabis with any patient, and recommend its use whenever appropriate. They may put that in writing or otherwise participate in state medical cannabis programs without fear of legal reprisal. This is true even when the recommending medical professional knows the patient will use the recommendation to obtain cannabis through a state program. What physicians may not do is provide cannabis directly to a patient or tell patients how or where to obtain it. For patients in pain, the goal is to function as fully as possible by reducing their pain as much as possible, while minimizing the often-debilitating side effects of the pain therapies. Failure to adequately treat severe and/or chronic pain can have tragic consequences. Not infrequently, people in unrelieved pain want to die. Despair can also cause patients to discontinue potentially life-saving procedures (e.g., chemotherapy or surgery), which themselves cause severe suffering. In such dire cases, anything that helps to alleviate the pain will prolong these patients’ lives. Opioid therapy is often an effective treatment for severe pain, but all opiates have the potential to induce nausea. The intensity and duration of this nausea can cause enormous discomfort and additional suffering and lead to malnourishment, anorexia, wasting, and a severe decline in a patient’s health. Some patients find the nausea so intolerable that they are inclined to discontinue the primary pain treatment, rather than endure the nausea. Inhaled cannabis provides almost immediate relief for this with significantly fewer adverse effects than orally ingested Marinol. Inhalation allows the active compounds in cannabis to be absorbed into the blood stream with greater speed and efficiency. It is for this reason that inhalation is an increasingly common, and often preferable, route of administration for many medications. Cannabis may also be more effective than Marinol because it contains many more cannabinoids than just the THC that is Marinol’s active ingredient. The additional cannabinoids may well have additional and complementary antiemetic qualities. They have been conclusively shown to have better paincontrol properties when taken in combination than THC alone. Opioid therapy is often an effective treatment for severe pain, but all opiates have the potential to induce nausea. The intensity and duration of this nausea can cause discomfort and additional suffering that can lead to malnourishment, anorexia, wasting, and a severe decline in a patient’s health. Some people find the nausea so intolerable that they are inclined to discontinue the primary pain treatment, rather than endure the nausea. Inhaled cannabis provides almost immediate relief for nausea with significantly fewer adverse side effects than orally ingested Marinol. Inhalation allows the active compounds in cannabis to be absorbed into the blood stream with greater speed and efficiency. It is for this reason that inhalation is an increasingly common, and often preferable, route of administration for many medications. Cannabis may also be more effective than Marinol because it contains many more cannabinoids than just the THC that is Marinol’s active ingredient. The additional cannabinoids may well have additional and complementary antiemetic qualities. They have been conclusively shown to have better pain-control properties when taken in combination than THC alone, and mitigate anxiety and other side-effects of THC. Britain’s House of Lords reached similar conclusions and called for making cannabis available by prescription. Robaxin‘s side effects include abnormal taste, amnesia, blurred vision, confusion, dizziness, drop in blood pressure and fainting, drowsiness, fever, flushing, headache, hives, indigestion, insomnia, itching, light-headedness, nasal congestion, nausea, pinkeye, poor coordination, rash, seizures, slowed heartbeat, uncontrolled eye movement, vertigo, vomiting and yellow eyes and skin. One of marihuana’s greatest advantages as a medicine is its remarkable safety. It has little effect on major physiological functions. There is no known case of a lethal overdose; on the basis of animal models, the ratio of lethal to effective dose is estimated as 40,000 to 1. By comparison, the ratio is between 3 and 50 to 1 for secobarbital and between 4 and 10 to 1 for ethanol. Marihuana is also far less addictive and far less subject to abuse than many drugs now used as muscle relaxants, hypnotics, and analgesics. The chief legitimate concern is the effect of smoking on the lungs. Cannabis smoke carries even more tars and other particulate matter than tobacco smoke. But the amount smoked is much less, especially in medical use, and once marihuana is an openly recognized medicine, solutions may be found; ultimately a technology for the inhalation of cannabinoid vapors could be developed. In December 2013, the American Herbal Pharmacopeia released a monograph identifying cannabis as a botanical medicine. Written and reviewed by the world’s leading experts on cannabis, the monograph provides a full scientific understanding of the plant, its constituent components, and its biologic effects. It also establishes comprehensive standards for the plant’s identity, purity, quality, and botanical properties. I have been permanently disabled since September 1995. I am a mother of two teenage children. My children know more than anyone how medical cannabis brought their mommy back to them. The hardest part of being disabled is watching the suffering in your children’s eyes as they watch you endure such suffering with no end in sight. The relief I experienced from medical marijuana was almost immediate. I was so pleased with the result that I wrote to Dr. Leff about my use of medical marijuana and we talked about the benefits of the medicine. Dr. Leff examined me and noted that medical marijuana helped me experience less chronic pain and nausea, leading him to recommended medical marijuana as part of my daily pain care regimen… I strongly feel that I should have the right to use anything that may relieve any or some of my pain, and my last days should not be spent suffering. . . . Ever since trying medical marijuana, my life has drastically improved. Although chronic pain, related to my post-polio syndrome will always be a part of my life, medical marijuana had helped me manage this pain by providing fast and effective relief for my muscle spasms, acute pains, and arthritis. Since I began using medical marijuana, my pain is no longer persistent or debilitating. When I do suffer from pain, I am usually able to “get ahead of it” by using medical marijuana and make it manageable. As a member of the 502nd infantry, 101st airborne, my unit was deployed to the kingdom of Jordan in the late 1980’s. Soon after, I found myself diagnosed with MS awaiting a medical discharge instead of starting my second enlistment. I’ve presently had MS for over 25 years, but I first tried cannabis for my condition about 11 years ago. Each time I went to the doctor with spasms or atrophy that was bending my body into painful and unnatural positions, I’d walk out with a new muscle relaxer or pain pill. By 2003 I found myself taking a cocktail of approximately 59 pills a day, which did little for the pain and spasms and instead turned me into what felt like a sleeping zombie. I’d literally fall asleep in the middle of a conversation! I was a prisoner in my own body. At first, my wife didn’t like my smoking on top of all the pills I was taking, but cannabis was providing unparalleled relief from the painful spasms and atrophy. No spasms or atrophy, no pain! After discussing it with her, we took inventory of my pills and began tapering down the ones I no longer needed thanks to the relief provided by one cannabis cigarette a day. We not only reduced the overall number of my pills to just 24 per day, we were able to eliminate some intoxicating medicines all together. By the time we were finished I no longer took Valium, Xanax for tremors, Gabapentin, morphine and Vicodin for breakthrough pain, and several others Also, I reduced the number of methadone I take per day. Since that time I have literally been a new man. I used to lay in bed for weeks at a time. I neither had the energy nor desire to ever leave my house. The pills were making me sicker and weaker. Now I only stay in bed at night and I go out often (when it’s warmer outside) and do the things I love. If I’m not going to a Bears/Blackhawks/Bulls/Cubs game, I’m going to Springfield to help pass our bill. Cannabis has allowed me to enjoy an active life that I thought had long passed me by. Eleven years later, and I still only smoke between one and two cannabis cigarettes per day. If smoking is not for you, they have edibles, vaporizers, tinctures and other ways of dispensing the product. Because of the bowel resection, I can only take a small amount of opiate painkillers before I have serious GI issues. But a little cannabis, just one to two grams a day, helps the opiates work better. Now I only take the smallest Oxycodone pill, 5mg, twice a day — a dose so low most doctors don’t even know they make it. I’ve found a regimen that works, and I’m grateful. A couple of times I’ve had gaps, and that’s been tough. With chronic pain, if you take my pain treatment away and force me to suffer, I have a real hard time getting back to stable. The last time I was without cannabis during a very stressful time it had negative consequences I am still working to recover from. In 1994, I was diagnosed with inoperable prostate cancer… the cancer had metastasized to my spine, hips, and ribcage. The neuropathic back pain was excruciating, emanating from my spine to my hips and ribcage. I also experienced an overall loss of strength that substantially limited my ability to work. Employment in the transportation industry involves a considerable amount of carrying, lifting, and other manual labor that requires flexibility and mobility. The performance of these requirements exacerbated the magnitude and amount of pain I experienced on a daily basis and depleted any energy that had not already been beaten down by the disease itself. Perhaps sensing that my hope was receding as my misery was increasing, a nurse at Stanford Hospital suggested that medical marijuana could alleviate my nausea, restore my appetite, and even help me manage my pain – all potentially without the negative side effects I experienced with Marinol and other medications.. I decided to try a small amount of medical marijuana, and when I did I found that it provided significant relief from the side effects of the cancer medications and the radiation treatment. In addition, it helped reduce the pain I was experiencing from the cancer itself. This new combination of therapies, which included medical marijuana, turned my health around. Where before I had been doubled over with nausea, couldn’t eat, or sleep, I was now not only able to handle my medications, but could sleep, eat and manage my pain. I found that a small amount of medical marijuana taken in the evening enabled me to sleep through the entire night so that I no longer needed to take Ambien. – Dr. Gracer is Director of Orthopedic Medicine for ChiroView. He is a Fellow of the American Academy of Family Physicians and a Diplomate of the American Academy of Pain Management. Insofar as The Compassionate Use Act passed in 1996 expressly provides that chronic pain is a condition for which physicians are authorized to recommend marijuana without threat or fear of punishment, the Act appears to be an additional assurance for physicians like myself that we can rely upon a full range of treatment modalities to care for patients in pain. The IOM Report provides still further support for doctors insofar as it recognizes the potential medical benefits of marijuana… Marijuana has a place in any pain physician’s armamentarium. – Dr. Brody is Chief of the Pain Consultation Clinic at San Francisco General Hospital. He is a peer reviewer for the Western Journal of Medicine, Journal of General Internal Medicine, Annals of Internal Medicine, and the Journal of Law, Medicine and Ethics. Federal policy on medical cannabis is filled with contradictions. Cannabis was widely prescribed until the turn of the century, and an estimated one million Americans currently use it under medical supervision. Congress in 1970 classified cannabis is a Schedule I drug, defined as having no medicinal value and a high potential for abuse, yet its most psychoactive component, THC, is legally available as Marinol and is classified as Schedule III. The U.S. federal government also grows and provides free cannabis for a small number of patients today as part of an Investigational New Drug (IND) compassionate access research program created by court order in 1976. Though the program provided up to nine pounds of cannabis a year to these patients, and all reported being substantially helped by it, the application process was extremely complicated, and few physicians became involved. In the first twelve years, the government accepted only a handful of patients. But in 1989 the FDA was deluged with new applications from people living with AIDS, and 34 patients were approved within a year. In June 1991, the Public Health Service announced that the program would be suspended because it undercut the administration’s opposition to the use of illegal drugs. The program was discontinued in March 1992 and the remaining patients had to sue the federal government on the basis of medical necessity to retain access to their medicine. Today, four surviving patients still receive medical cannabis from the federal government. Despite this successful federal program, thousands of scientific articles, and dozens of successful clinical trials, as well as an unparalleled safety record, cannabis remains classified as a Schedule I substance. Healthcare advocates have tried to resolve this contradiction through legal and administrative channels. In 1972, a petition was submitted to reschedule cannabis in order to remove barriers to medical research and patient access. The DEA stalled hearings for 16 years, but after exhaustive hearings in 1988 their chief administrative law judge, Francis L. Young, ruled that “marijuana, in its natural form, is one of the safest therapeutically active substances known… It would be unreasonable, arbitrary and capricious for the DEA to continue to stand between those sufferers and the benefits of this substance.” The DEA refused to implement this ruling based on a procedural technicality and continues to insist cannabis is a substance with no medical use. In 2009 the American Medical Association, the nation’s largest organization for physicians with a quarter million members, joined the chorus of professional medical groups calling on the federal government to reconsider the classification of cannabis and urging comprehensive clinical trials. 6. Criminal liability for aiding and abetting requires proof that the defendant “in some sort associate[d] himself with the venture, that he participate[d] in it as something that he wishe[d] to bring about, that he [sought] by his action to make it succeed.”Conant v. McCaffrey, 172 F.R.D. 681, 700 (N.D. Cal. 1997) (quotation omitted). A conspiracy to obtain cannabis requires an agreement between two or more persons to do this, with both persons knowing this illegal objective and intending to help accomplish it. Id. at 700-01. 30. O’Shaughnessy WB (1838). On the preparations of the Indian hemp, or gunjah (Cannabis indica); their effects on the animal system in health, and their utility in the treatment of tetanus and other convulsive diseases. Transactions of the Medical and Physical Society of Bengal 18; 40: 71-102, 421-61. 83. Callahan R (1998). 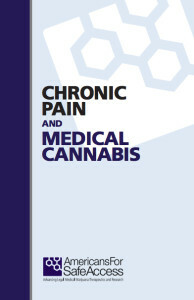 “How Does Marijuana Kill Pain?” Associated Press, October 4. http://www.mapinc.org/drugnews/v98/n868/a07.html. 88. House of Lords Select Committee on Science and Technology, “Ninth Report” (1998). London: United Kingdom. Section 5.26. “Adults with post-traumatic or postsurgical neuropathic pain were randomly assigned to receive cannabis at four potencies (0%, 2.5%, 6% and 9.4% tetrahydrocannabinol) over four 14-day periods in a crossover trial. Participants inhaled a single 25-mg dose through a pipe three times daily for the first five days in each cycle, followed by a nine-day washout period. Daily average pain intensity was measured using an 11-point numeric rating scale.